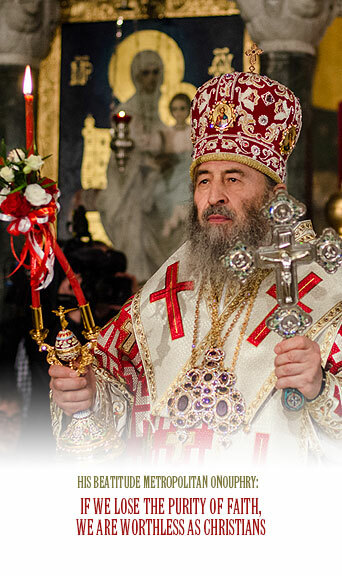 “Remain true to Christ, then His grace will not let you lose your way in the darkness of the temptations of today,” said His Beatitude Metropolitan Onuphry of Kiev and All Ukraine. – Your Beatitude, lent is always a time of self-restraint, and not only in dietary terms. First of all this concerns spiritual life. Today as never before it is important to gain humility, which is always expressed as trust in God, His Church, the Hierarchy. Why is this so difficult for people, and how do we approach this attitude? How do we learn to trust in God? – During the holy Nativity lenten period, every believer must try to enrich himself with invaluable spiritual gifts, among which the most dear is humility. A humble person accepts with gratitude all that the Lord sends him. He never considers God to be indebted to him, for he knows that he himself is indebted to God for all the good things that He provides. Humility is the proper understanding of peace, the correct grasp of Who the Lord is, who we are, who our neighbor is. The first step towards humility is recognizing oneself as the creation of God. With profound humility, a person who tries to live by the commandments begins to look at himself critically, analyzing his actions, his state of mind, his emotions and thoughts, and rebuke himself for his failures and weaknesses. Only then will he humble himself before Divine will and surrender himself to His will, then he will trust in God and devote himself to Him. – Your Beatitude, how are believers to react to the possible (the worst-case) scenario around the Church? – People who don’t understand the nature of the Church view it as a great ship traveling upon the sea. But they don’t see the Great Helmsman and think that His place can be occupied by someone else. But Christ guides the Church. Those who don’t understand sometimes brazenly intrude upon Church life and think themselves as controlling the fates of the Church. Employing purely political approaches, they form their own models of ecclesiastical order and carelessly direct us the way to go, beneficial to them but unacceptable to us. The frivolity of their strange decisions are based not only on a lack of understanding of Divine Law, but on the fact that for them the Church is alien, as is Church life itself. The Church does not occupy a place in their life, it is their “hobby.” We do not rebuke such politicians, we pray for them, we love and respect them, but ask that they not interfere in the canonical order of the Church. This will do no good to anyone: not them, not our Ukrainian land, not our people. For those of us for whom the Church is the Ship of salvation and their very life, we lovingly bear witness that we don’t need to go elsewhere, that we have everything we need for salvation. The Church has autonomy, all the administrative, financial and canonical freedoms necessary for the effective service to God and our people. We must preserve the purity of the Holy Orthodox faith. But the path we are being offered today is fraught with peril, for it proposes many limitations, there is a danger of losing the purity of faith. If this occurs, then we are worthless as Christians. We will become spiritual enemies to our own selves, to our land and to our people. Pure faith helps to properly organize our lives on earth and attain salvation in Heaven, it invokes Divine blessings to earth. Dear brothers and sisters, strive to preserve our faith, don’t exchange it for temporary pleasures, Remain true to Christ, and then His grace will not let you lose your way in the darkness of the temptations of today.